LOS ANGELES, (Variety.com) - Disney-Marvel's "Black Panther" has maintained its momentum at the domestic box office, winning its fifth consecutive weekend with $27 million (19.36 million pounds) from 3,834 locations. Alicia Vikander's "Tomb Raider" finished second in its opening weekend in line with expectations with $23.5 million from 3,854 sites for Warner Bros. and MGM. The videogame-based action adventure score a B grade from moviegoers in CinemaScore exit polls. Lionsgate-Roadside Attractions' faith-based drama "I Can Only Imagine" outperformed forecasts with $17.1 million at 1,629 venues, notching the top per-screen average in the top 10 with $10,476. The studio plans to expand "I Can Only Imagine," based on the story behind the hit song of the same name, to more than 2,000 sites next weekend. Disney's second weekend of time-travel adventure "A Wrinkle in Time" followed in fourth with $16.6 million at 3,980 locations, lifting its 10-day total to $61.1 million. "Wrinkle," directed by Ava DuVernay, declined by exactly half from its opening weekend. Fox's launch of gay teen comedy-drama "Love, Simon" took fifth with $11.5 million at 2,402 venues, amid strong support from critics with a 91 percent "fresh" rating on Rotten Tomatoes. "Simon," starring Nick Robinson as a conflicted high schooler, notched an A+ CinemaScore with the audience, giving Fox execs hope for strong word of mouth and extended playability. Females comprised 58 percent of ticket buyers. "Black Panther" has become only the seventh title to pass the $600 million milestone at the North American box office, and is the second-fastest film to do so. It's the fourth-highest fifth weekend of all time, and the first time a film has held the top spot for five weekends in a row since 2009's "Avatar." "Black Panther" has totalled a stunning $605.4 million in 31 days. It's poised to pass "Star Wars: The Last Jedi" ($619.8 million) for sixth place and "The Avengers" ($623.4 million) for fifth place on the all-time domestic list by the end of next weekend. And it's likely to eventually pass "Jurassic World" at $652.3 million for fourth place and "Titanic" at $659 million for third place. "Star Wars: The Force Awakens" tops the list at $936 million followed by "Avatar" at $760 million. The weekend's overall box office took in about $130 million, down 50 percent from the same weekend last year when Disney's "Beauty and the Beast" opened with $174.5 million. Thanks to "Black Panther," the year-to-date box office is up 2 percent over the same period a year ago at $2.5 billion, according to comScore. "'Black Panther' continues to astonish as it shows incredible strength fully five weeks into its amazing run as it takes on another batch of notable newcomers and comes out on top," said Paul Degarabedian, senior media analyst with comScore. 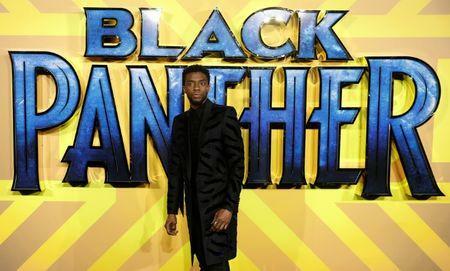 "Black Panther" will face competition next weekend from Universal-Legendary's launch of "Pacific Rim: Uprising" and Paramount's animated comedy "Sherlock Gnomes." Recent tracking for the "Pacific Rim" sequel has been in the $20 million to $30 million range while "Sherlock Gnomes" was in the $13 million to $18 million range. Warner Bros.' fourth weekend of R-rated comedy "Game Night" took sixth place with $5.6 million at 2,686 locations, pushing its 24-day gross past $54 million. Sony's sixth weekend of family comedy "Peter Rabbit" followed with $5.2 million at 2,725 sites for a 38-day total of $102.4 million. Aviron's second weekend of horror sequel "Strangers: Prey at Night" finished eighth with $4.8 million at 2,464 venues. Fox's third weekend of "Red Sparrow" followed in ninth with $4.5 million at 2,583 venues, pushing the Jennifer Lawrence thriller past $39 million. MGM's third weekend of its "Death Wish" reboot rounded out the top 10 with $3.4 million at 2,676 locations to give the Bruce Willis vehicle $30 million in 17 days. Paramount's fourth weekend of "Annihilation" and Sony's 13th weekend of "Jumanji: Welcome to the Jungle" tied for 11th place with $1.7 million. "Jumanji," which won its third, fourth, fifth and seventh weekends, became the 30th film to cross the $400 million mark in domestic grosses.